Just a note up front: this is one of those movies where much of the nitty-gritty of my opinion comes from the later parts of the film. That said, I’ll try to dance around most of the major story beats, but if you’ve already decided to see this one, you’re better off going without reading this review. The short version: Elysium is a movie that has a lot of really great elements that are undermined by some really poor choices. It’s a mixed bag, probably worth seeing if you’re into sci-fi, but a disappointing follow-up to District 9. Now, onto the real review. 2009 was the year that I transitioned between my last year of high school and my first year of college; at the time I wasn’t quite as invested in film as I am today. I have loved film all my life, and 2009 was certainly no exception, but like many people I spent a significant portion of my high school years questioning what I really wanted to do with my life. If I had to pick one watershed moment that really got me back into the mode of wanting to be involved in the film industry it would likely be seeing The Dark Knight at midnight the morning of July 18, 2008, however, that moment did not occur in isolation. There were several films throughout the second half of 2008 and the year of 2009 that influenced me in an incredibly significant way. Films like WALL·E, Hellboy II, Inglourious Basterds, Up, and yes, The Dark Knight. One of those movies was a science fiction film from first-time feature director Niell Blomkamp called District 9. District 9 brilliantly layered metaphor and allegory on top of an incredibly rich, endlessly enjoyable, science-fiction action film. It had really well-crafted characters, a strong narrative arc, and left you wanting more at the end in the best possible way. After such a great film, myself (and many others) were eagerly anticipating his follow-up. That follow-up, titled Elysium, is set in Los Angeles in the year 2154. Overpopulation and environmental decay have left Earth a grime-coated wasteland where the majority of humanity muddles through day-to-day working menial jobs to sustain something that barely qualifies as a life. Max Da Costa is part of this majority; he’s a reformed car thief, currently on parole, who is working at a factory that constructs robots which are used as a police force as well as private security for the wealthy. You see, because Earth is in such a terrible state, the wealthy have set up residence on an off-world space station called Elysium. Elysium is a veritable paradise, with no poverty, no crime, and – thanks to high tech medical pods – no disease. In order to protect that way of life, though, Elysium has extremely strict requirements for citizenship, and anyone whose genetic ID indicates their current residence as Earth cannot gain entry to Elysium. Max has always dreamt of finding a way to live on Elysium, but when he is accidentally exposed to a lethal dose of radiation at his factory job, his fantasy becomes a life-dependent necessity. With the help of some of his old contacts in the criminal underworld, Max is outfitted with a strength enhancing exo-suit which he uses to hijack his boss’ car and steal the genetic identification held in his brain, allowing him access to Elysium. Unbeknownst to Max, his boss was working with Elysium’s Secretary of Defense Delacourt – who is planning to stage a coup against Elysium’s president – to develop an override code to Elysium’s automated systems. So when Max downloads his boss’ genetic information (yeah, in Elysium people have 30-pin connections built into their heads) he also inadvertently gets the override code for Elysium. That’s the main thrust of the story, but there’s at least three other characters that each have their own major agendas and play into the story in various ways. We’ll get to all that in a minute. 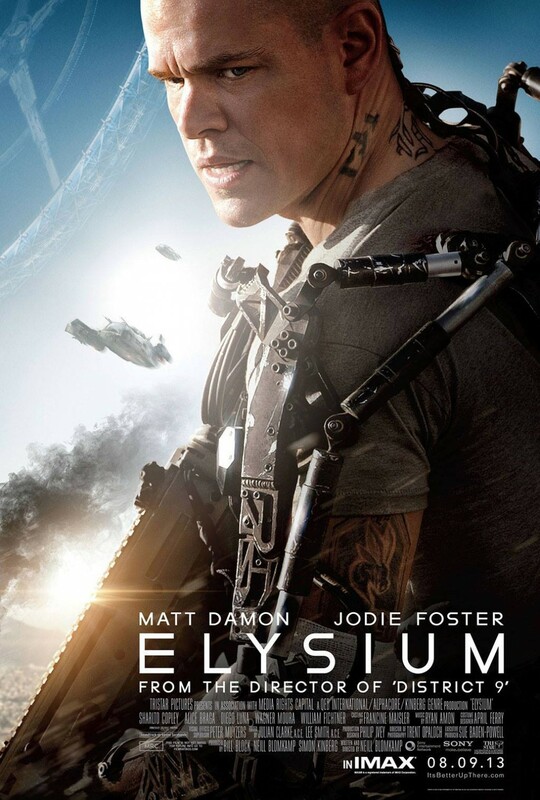 Elysium is…disappointing. I can’t go so far as to say the movie is bad, because there are a lot of really great things about it. Like District 9, the production design and the world building are breathtaking. This is a world that feels real and vivid and lived in, and there are interesting details that come across in nearly every frame of the film. Elysium is lush while at the same time being immaculate. Earth, on the other hand is bleak and cluttered; Los Angeles looks like a third world war zone with skyscrapers having been retrofitted haphazardly to accommodate low quality housing. It takes a page from movies like Alien, Blade Runner, and even Star Wars, with technology that, despite being decidedly futuristic, looks several generations out of date, where Elysium itself is more the “shiny-new” aesthetic seen in works like Star Trek, 2001, and, more recently Mass Effect (Elysium is very reminiscent of the Citadel’s Presidium). In addition, Matt Damon does a good job in the role of Max, and his story has a strong arc featuring a lot of powerful and entertaining moments. It’s when the story moves away from Max and starts focusing on other characters that we start running into trouble. In my review of Turbo, I talked a little bit about the troubles that can crop up with having too many points of view in a story. Terry Rossio has a really great piece going into greater detail about all of this, but the short version is that in many cases it benefits a story to restrict the point of view to one or two characters rather than jump willy-nilly from POV to POV. As Terry Rossio acknowledges, this isn’t a hard-and-fast rule, and there are dozens of stories with several points of view that work just fine, but in the case of Elysium I felt the frequent shifts in character perspective jarring and narratively problematic. As I’ve said, Max is the main character in this story, so naturally he gets the most amount of screen time. However, large sections of the film get divided up between a number of other characters. Max’s childhood sweetheart, Frey, has grown up to become a nurse with a daughter who is dying of cancer. Spider, a smuggler with whom Max has connections, helps equip Max to break into Elysium. Max’s boss, and Elyisum’s Delacourt each have significant amounts of screen time, as does Kruger, a completely insane hired gun. Including Max, we have a grand total of six different POV characters, and it tends to overwhelm the film. Max is our audience surrogate, he’s the one we’re following through the film, but the film frequently takes us away from him so we can follow other characters who have varying degrees of importance to the primary goal at hand. Many of these characters’ stories feel tacked on in an attempt to flesh out characters who would otherwise be single-use plot devices, and while that may be an admirable goal, it hurts the focus of the film’s primary story. In fairness, my friend Phillip Bastien (@PABastien on Twitter), argues that Kruger is there as sort of an anti-Max, a dark reflection of Max’s ambition and drive. He argues that the craziness works because it’s the polar opposite of Max’s control. These are all completely valid points and do give Kruger some purpose beyond being just a threat for Max, but these are also elements that feel sort of divorced from this story. Elysium is a political parable, it’s a story about social issues such as classism, immigration, and healthcare, and it’s handled in a way that is fairly blunt and unsubtle (this is an observation, not a criticism). It’s not really a story about Max overcoming his own demons – the type of story where that kind of dark reflection tends to work best – but more a story about a man who finds himself in a situation where he must rise to the occasion and become a hero. I honestly feel that the story would have been much more focused if Kruger had been written out. The Delacourt would have been the primary antagonist through to the very end, and the physical threats to Max could have been handled by the already established robots (which even could have been more thematically pertinent as Max’s life is threatened by the very things he built to make a living). At the very least Kruger should have stayed dead when his face was blown-off rather than being revived into the video game trope of the reoccurring boss monster. Speaking of which, in both of Blomkamp’s films thus far, there has been a clear influence from video games. The way this was handled in District 9 was just about perfect. It was fun and exciting, but also felt like a natural extension of the movie world. Here, it often feels less congruous. I’ve already discussed the silliness of Kruger when compared to the rest of the film, but even some of the structural qualities feel like they were designed for a video game rather than a film. Retrieving the genetic information from Max’s boss, fighting Kruger, and returning to base, feels like a fetch-quest; and the final sprint to the proverbial finish complete with one last confrontation with the boss monster would be right at home in the world of video games. Many aspects of the narrative don’t feel organic, but rather like levels in a video game. If this were an adaptation of a video game we would easily be praising it as the best video game movie ever made (by A LOT), but as original sci-fi it is somewhat disappointing. There’s a lot to like in Elysium, its political allegory is handled well, there are some strong performances, truly fantastic visuals and world building, and, when it sticks to it, Max’s story is quite good. Unfortunately these good things are consistently undermined by bad choices made throughout the film. Elysium is by no means a bad movie, just an underwhelming and disappointing one.